Why does my heading "act" as a link? Hey all. 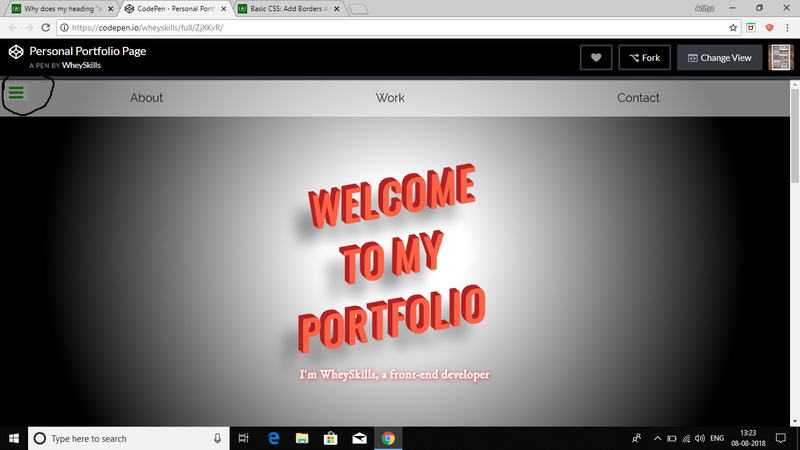 I’m building my personal portfolio page. At the bottom where it says: " Did you like my work? Contact me here"
It acts as a link, even though I only nested it in h3 tags. How can I make it a simple heading? You didn’t close the anchor tag that you initiated for “celebrity tribute page”. Another thing I noticed is that I don’t see the js script from FCC that tests the page. Why does that happen? In your editor or on your page? Both. I have the script but it just doesn’t show. i can see the test script both on your page as well as editor. Turns out it was my chrome extension “Privacy Badger” which was blocking the script.